It was halfway through the safari, and everyone was starting to get nervous. We hadn’t seen any lions yet. What if we didn’t see them today? What if we didn’t see them until the last day? What if we didn’t see them at all? Mike, our guide, kept telling us not to worry, but I’m sure he was feeling the pressure too. After all, it was his job to show us the animals. Every day he would point out tracks in an optimistic tone — small thrills to tide us over. The enormous cat prints were unmistakable, even to us. 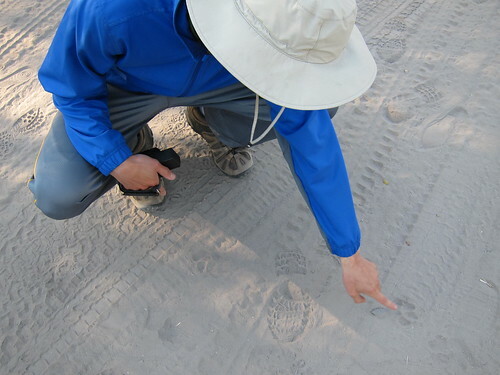 Mike followed the tracks through the vast, dried-out marshes of Savute, our Land Cruiser throwing up a cloud of dust. Ahead, another group was already on the same trail. But when we all came to a fork in the road, the other group turned right. Mike paused, eyed the horizon, double-checked the tracks, and went left instead. Five minutes later, we found the lions. Two of them — large, graceful females lounging almost invisibly among the yellow grass. We drove right up to them, close enough to see whiskers, and the rise and fall of their chests. They paid no attention to our excited whispers, or the furious clicks of our cameras. Suddenly, a family of warthogs came trotting down the plains. Mike noticed them first and alerted the rest of us. By the time we picked out their silhouettes in the distance, one lioness was already sitting up, angling forward with interest. Without a sound, she stood and began to walk in a wide arc around our Land Cruiser. She was moving downwind, Mike explained, so that the warthogs would not smell her coming. Her body was low and lithe, a mere shadow slicing through the savannah. The second lioness sat up but stayed in place, waiting for her cue. 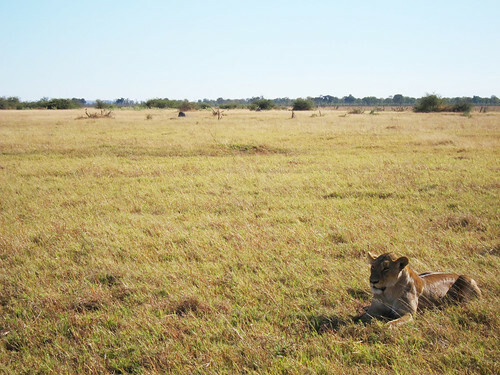 She watched, as we all did, while the first lioness got into position. Then it was her turn. The second lioness made her own arc in the opposite direction, smaller and quicker, but just as deadly quiet. After ten minutes of this stalking, the lions had trapped the warthogs between them. The unknowing prey continued to sniff the area for food, until one warthog caught a different scent. 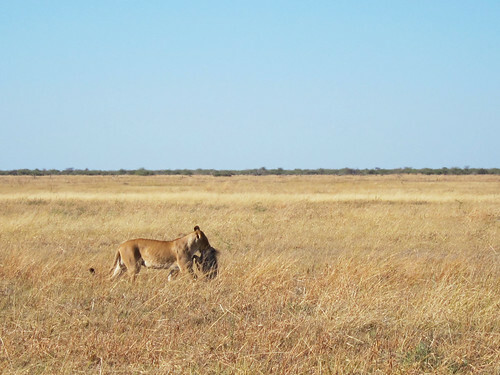 He walked upwind, toward the second lioness, and raised his nose into the air. Something was wrong, even if he didn’t know quite what. Still concerned, he went downwind and sniffed again. 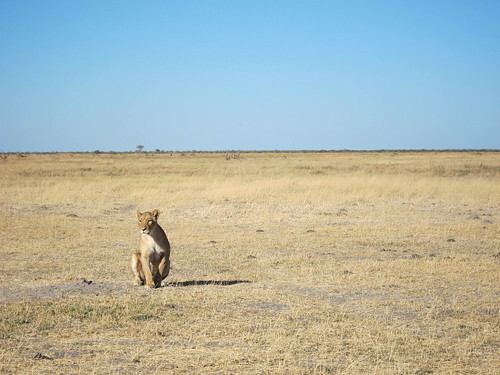 That’s when the first lioness pounced. Fluid as water, she sprang forward, and the warthogs fled for their lives. In their terror, they ran right into the path of the second lioness, and she was ready. Within seconds the chase was over. A young warthog dangled from her jaws. The trap had worked. The other three warthogs did escape, sprinting away with their tails straight up in the air so they could follow one another to safety. 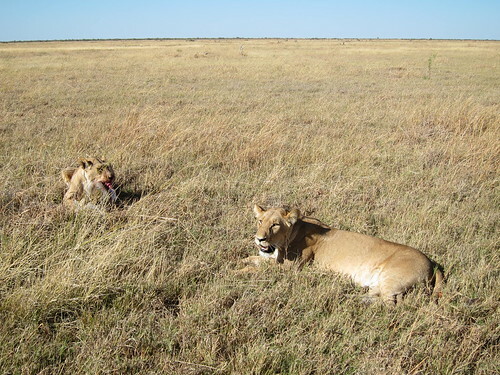 Meanwhile, the second lioness held their fallen brother, teeth sunk into neck, and she lay down to wait until he died. The whole thing was remarkably calm, brief, and gentle. Beautiful, in its way. 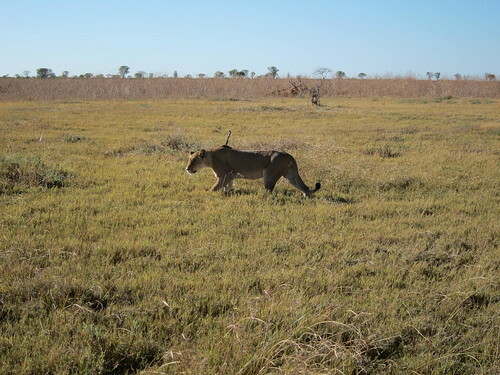 We continued to watch and record as the second lioness feasted on her kill. We heard the crunching of bones and tendons, saw the pinking of paws and snout. For a while, the first lioness kept a respectful distance, but by the time gray entrails were being pulled from the warthog’s body, she had moved closer, and received a warning growl for it. Almost an hour had passed since we’d first found the lions, and we ended up driving away before they traded off on the meal. But that didn’t bother us. Nothing bothered us anymore. Because we had seen lions, had seen a kill from start to finish. The rest of the safari would just be icing on the cake. Wow, what an amazing experience. Something most people have only seen on TV! Kristan, this is really top-notch writing. I felt like I was there. More to the point – I wish I had been there. Sounds like an incredible trip. Yeah, not gonna lie, we definitely had the Lion King songs stuck in our head the whoel time. Oh? We ended our trip with a day in Livingstone, Zambia — really only enough time to see Victoria Falls. But it was so worth it. Did you see the Falls? What all did you do in Zambia?